ownership separation removes them from the telco entirely. Within those categories, there are many more shades of detail. Julian Salanave, director of telecoms markets and strategies at IDATE, recently gave an excellent presentation [PDF] on the parallels between these and some other industries. We all know about Openreach, an example of operational separation at incumbent BT. Railtrack was an example of ownership separation on the railways. This in itself is not unknown; US long-distance passenger services have been operated under ownership separation since the early 1970s, where Amtrak operates the trains over individual railroads’ metals. 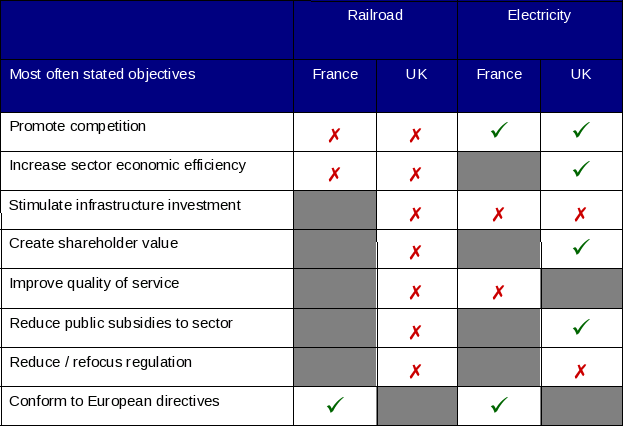 More recently, the European Commission has been keen to push structural separation at least between trains and track. Italy and France have both undertaken the challenge, but Britain went first. In the early years of the rail industry it operated as a privately funded infrastructure, and had many parallels with the dotcom boom. (The economics have been well documented by Andrew Odlyzko, who also has a forthcoming book on the parallels between the railways and the Internet). Then from 1948 to 1996, UK railways were a fully vertically-integrated, state-owned industry: British Railways owned trains, track, stations, signals, property, maintenance, R&D, the full monty. The privatisation plan foresaw total transformation. Each major route or suburban network would be tendered for as a franchise, the trains themselves would be sold to private investors who would lease them to the franchisees, and the railway infrastructure would be privatised as a single company, Railtrack. The railways’ central functions were either shut down (like BR Research) or sold separately (like BR’s train-building arm BREL). In a sort of second privatisation, Railtrack outsourced the entire engineering function. Maintenance was subcontracted, as was new construction. Top management would rely on consultants for engineering advice. It was as if the only engineers left in any position of power was the regulator, and they only engineered powerpoint charts, not train engines. Railtrack’s income stream came in the first instance from charging the train operators for access to the track, plus a government subsidy. It also had fringe revenues such as retail rentals on major stations, property development on railway-owned land, air rights, and the like; the original directors saw this as the main growth play. At the same time, the train operators received both fares, and (with two exceptions) subsidy. Profits at Railtrack accrued, of course, to shareholders. The whole point of separation was to isolate non-competitive and non-marketed segments of the industry and let competition reign in the others. This implied that Railtrack, being a monopoly, must be regulated. Similarly, the individual train operators were rarely in genuine competition with each other or other modes of transport. So from the beginning, the internal market was more a case of political science than economics. The actual trains (many dating from the 1960s) were sold off at knock-down prices to leasing companies. These were run by ex-BR managers who promptly worked the system to make millions for themselves, by renting them back to their captive train operating customers. Nobody had an overall responsibility for the functioning of the system; the internal restructuring of Railtrack led to a loss of institutional expertise so serious that the cost of trackwork went up by an average factor of 3.14 and stayed there. Further, Railtrack management adopted radical new practices — replacing regular inspection of the track with “fix-on-fail” — that the old BR Engineering directorate was unlikely to have sanctioned. Critically, there was no independent safety engineering authority, nor an R&D function. The upshot was a serious breakdown in safety. It’s one think to separate the ownership of the trains and tracks. It’s quite another when express trains start to fall off broken rails at over 100mph. This was combined with the above-mentioned surge in costs (known in the business as the Ford Factor), and abysmal operational performance. The only genuine competition was between Railtrack and the train operators; as they were subject to regulatory fines for poor performance, their contracts with Railtrack stipulated that they could recover these under penalty clauses if the problems were the fault of Railtrack. This took no account of the fact that a train could cause damage to the track, or vice versa, or that the two sides uneasily shared control of railway stations and timetabling. It made more sense to invest in lawyers than lines. Rather like sub-prime mortgages, separating out the parts had diffused information, responsibility and risk too far. After 2001, Railtrack was returned to public ownership, under a new special entity called Network Rail. Perhaps the ultimate testament to the disaster was that Network Rail immediately began to reintegrate various functions, and each step was associated with a reduction in costs. Simply, the informational asymmetry between Railtrack, the contractors, and the train operators was too great for anything like normal oversight to work. The coupling between the trains and the track was too close for this degree of separation to function. The current arrangement has seen Network Rail progressively regain powers of co-ordination over the train operators, in-house responsibility for maintenance, and responsibility for the timetable. Railtrack-like problems can and do exist in telecoms, even though the degree of coupling between packets and layer-one (physical) infrastructure is minimal. (You can hack into a router; you can’t hack through a cable without using an axe). We see them every time there’s a backhoe outage, especially when it turns out that the alternate fibre path was actually in the same dig next to the road as the primary. It’s very difficult for ‘train operators’ — ISPs, applications service providers, and others up at layer 3 and above — to know enough about what’s happening with the underlying infrastructure. Similarly, we see this difference between bitstream or LLU and the alternative of vertical integration. When the exchanges, digs, and customer premises access belong to a competitor, rather than a neutral third party, this matches the problem of the train operators’ adversarial relationship with Railtrack. Another problem, one which dogged Amtrak and the British train operators in the Railtrack years, is the question of incentives to expand. You can’t offer more trains or faster trains or longer trains without sufficient train paths, but there was a major disconnect between infrastructure costs and the funds an operator with a franchise up to 10 years could raise. Like all profit-making monopolists, Railtrack’s incentives were to restrict supply and ignore technical innovation; but it’s the very nature of infrastructure that there is no way for the Schumpeterian process of creative destruction to work on it.